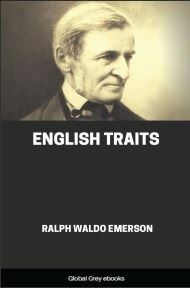 Chapters include: First Visit to England; Voyage to England; Land; Race; Ability; Manners; Truth; Character; Cockayne; Wealth; Aristocracy; Universities; Religion; Literature; The “Times”; Stonehenge; Personal; Result; and, Speech at Manchester. I have been twice in England. In 1833, on my return from a short tour in Sicily, Italy, and France, I crossed from Boulogne, and landed in London at the Tower stairs. 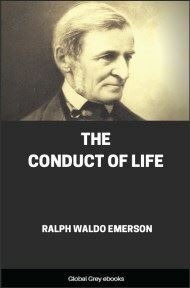 It was a dark Sunday morning; there were few people in the streets; and I remember the pleasure of that first walk on English ground, with my companion, an American artist, from the Tower up through Cheapside and the Strand, to a house in Russell Square, whither we had been recommended to good chambers. For the first time for many months we were forced to check the saucy habit of travellers’ criticism, as we could no longer speak aloud in the streets without being understood. The shop-signs spoke our language; our country names were on the door-plates; and the public and private buildings wore a more native and wonted front. 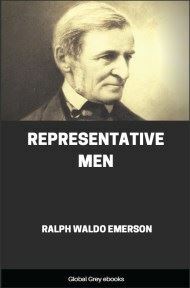 Like most young men at that time, I was much indebted to the men of Edinburgh, and of the Edinburgh Review, — to Jeffrey, Mackintosh, Hallam, and to Scott, Playfair, and De Quincey; and my narrow and desultory reading had inspired the wish to see the faces of three or four writers, — Coleridge, Wordsworth, Landor, De Quincey, and the latest and strongest contributor to the critical journals, Carlyle; and I suppose if I had sifted the reasons that led me to Europe, when I was ill and was advised to travel, it was mainly the attraction of these persons. If Goethe had been still living, I might have wandered into Germany also. Besides those I have named, (for Scott was dead,) there was not in Britain the man living whom I cared to behold, unless it were the Duke of Wellington, whom I afterwards saw at Westminster Abbey, at the funeral of Wilberforce. The young scholar fancies it happiness enough to live with people who can give an inside to the world; without reflecting that they are prisoners, too, of their own thought, and cannot apply themselves to yours. The conditions of literary success are almost destructive of the best social power, as they do not leave that frolic liberty which only can encounter a companion on the best terms. It is probable you left some obscure comrade at a tavern, or in the farms, with right mother-wit, and equality to life, when you crossed sea and land to play bo-peep with celebrated scribes. I have, however, found writers superior to their books, and I cling to my first belief, that a strong head will dispose fast enough of these impediments, and give one the satisfaction of reality, the sense of having been met, and a larger horizon. 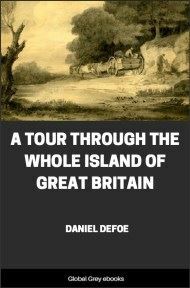 On looking over the diary of my journey in 1833, I find nothing to publish in my memoranda of visits to places. But I have copied the few notes I made of visits to persons, as they respect parties quite too good and too transparent to the whole world to make it needful to affect any prudery of suppression about a few hints of those bright personalities. At Florence, chief among artists I found Horatio Greenough, the American sculptor. His face was so handsome, and his person so well formed, that he might be pardoned, if, as was alleged, the face of his Medora, and the figure of a colossal Achilles in clay, were idealizations of his own. Greenough was a superior man, ardent and eloquent, and all his opinions had elevation and magnanimity. He believed that the Greeks had wrought in schools or fraternities, — the genius of the master imparting his design to his friends, and inflaming them with it, and when his strength was spent, a new hand, with equal heat, continued the work; and so by relays, until it was finished in every part with equal fire. Greenough brought me, through a common friend, an invitation from Mr. Landor, who lived at San Domenica di Fiesole. On the 15th May I dined with Mr. Landor. I found him noble and courteous, living in a cloud of pictures at his Villa Gherardesca, a fine house commanding a beautiful landscape. I had inferred from his books, or magnified from some anecdotes, an impression of Achillean wrath, — an untamable petulance. I do not know whether the imputation were just or not, but certainly on this May day his courtesy veiled that haughty mind, and he was the most patient and gentle of hosts. He praised the beautiful cyclamen which grows all about Florence; he admired Washington; talked of Wordsworth, Byron, Massinger, Beaumont and Fletcher. To be sure, he is decided in his opinions, likes to surprise, and is well content to impress, if possible, his English whim upon the immutable past. No great man ever had a great son, if Philip and Alexander be not an exception; and Philip he calls the greater man. In art, he loves the Greeks, and in sculpture, them only. He prefers the Venus to every thing else, and, after that, the head of Alexander, in the gallery here. He prefers John of Bologna to Michael Angelo; in painting, Raffaelle; and shares the growing taste for Perugino and the early masters. 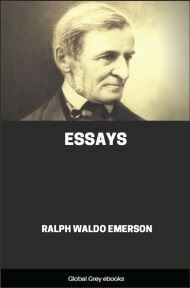 The Greek histories he thought the only good; and after them, Voltaire’s. I could not make him praise Mackintosh, nor my more recent friends; Montaigne very cordially, — and Charron also, which seemed undiscriminating. He thought Degerando indebted to “Lucas on Happiness” and “Lucas on Holiness”! He pestered me with Southey; but who is Southey?